With over 87 people infected and nine dead, Flint, Michigan officials’ ineptitude warrants not just resignations but criminal charges. For 18 months, the city used the Flint River as a source of drinking water, a cheaper alternative to buying it from Detroit. A lack of corrosion control allowed lead to seep into the city’s water supply from outdated pipes, poisoning Flint’s residents. This contamination crisis, occurring in a low-income town with a 57 percent black majority, has been called one of the worst outbreaks of Legionnaires’ disease in U.S. history. The outbreak of the respiratory disease, which causes severe pneumonia, began in summer 2014 after the water supply changed from Lake Huron to the Flint River in April, saving the city $12 million a year. Corruption and willful ignorance about Flint’s water toxicity led many to demand Michigan state officials to resign. Some are calling for the arrest of Gov. Rick Snyder, who failed to call the Federal Emergency Management Agency when his task force had early knowledge about elevated lead levels in children’s blood last October. According to Crain’s Detroit Business, residents immediately complained about the smell, taste and appearance of the water in April 2014. Shortly after, three boil-water advisories were issued in 22 days after positive tests for coliform bacteria. 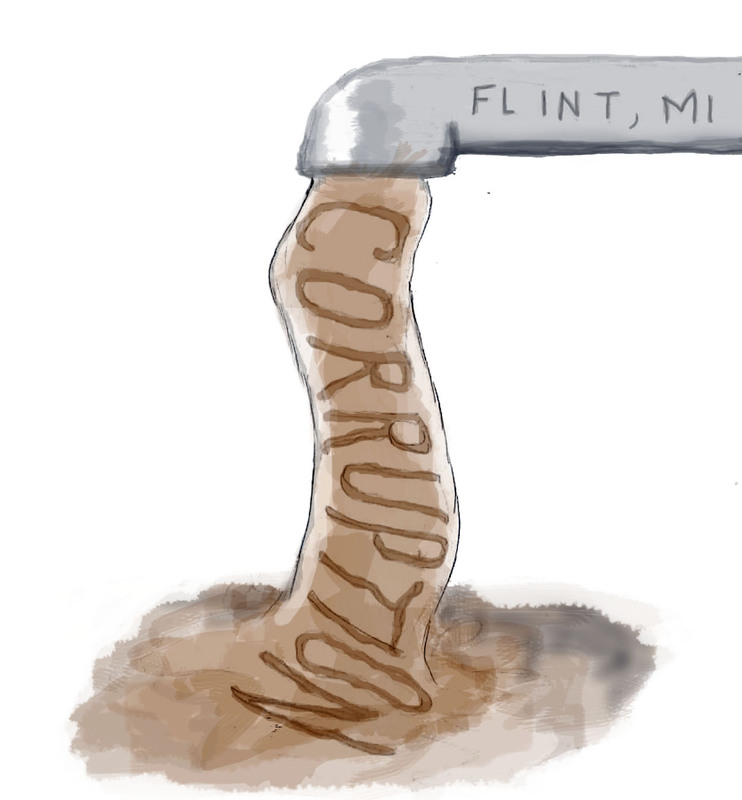 In Oct. 2014, a General Motors engine plant stopped using Flint water, since it rusted parts. General Motors took no time in protecting its car parts, but it took time for Snyder to acknowledge the issue, let alone protect Flint residents. It took the state over a year to publicly recognize that lead was the problem, despite residents’ initial complaints. According to the Center for Disease Control’s (CDC) protocol, a state must “invite” the agency to investigate an outbreak — an invitation Michigan failed to send at the beginning of the uptick in the disease. Genesee County Health director Jim Henry told CNN last week that his colleagues were obstructed from communicating with the CDC and because of governmental negligence, entirely preventable deaths occurred. Snyder announced Sunday that he asked to expand Medicaid support for about 15,000 more Flint residents, especially for pregnant women and those under 21, in the wake of the city’s water crisis. Last month, President Barack Obama promised to contribute $80 million to remedy the crisis, but that amount still won’t cover the bill, nor remedy the fact that nearly 90 people have been poisoned and nine have lost their lives. Snyder’s emails said it could take 15 or more years to replace the pipes that contaminated Flint’s tap water. His attempt to cut corners to save $12 million annually backfired with lethal results. Nobody should have to live with poisoned water running through the pipes of their home caused by the government’s decisions, or lack thereof. While the government is now offering solutions, treating the damage they caused in no way absolves it from its massively criminal oversight. Snyder told journalist Charlie Leduff that if his grandchildren lived in Flint, he would let them bathe in the city’s toxic water. But the fact is they don’t have to because grandpa is a state governor and owns a $2 million condo in Ann Arbor. Unlike the residents of Flint, Snyder and his family have a choice when it comes to where they drink and bathe. While Flint just had another boil-water advisory lifted, the officials responsible for this crisis have yet to face any charges. These state officials, including Snyder, should be charged with involuntary manslaughter. According to The New York Times, the water distribution system within Flint, possibly all of it, will likely require replacement as high as $1.5 billion. This doesn’t include care for the thousands of children whose health will suffer from lead poisoning. The children affected by lead poisoning will need significant attention, nutritional support and special education due to the harm caused by this man-made disaster. State officials have the blood of innocent citizens on their hands, and this level of bureaucratic incompetence demands justice. If we are to expect any level of governmental accountability in this country, we cannot idly stand by while systemic inequalities and failures are leaving people dead.